It’s almost July which means fireworks, BBQ’s and hot weather. 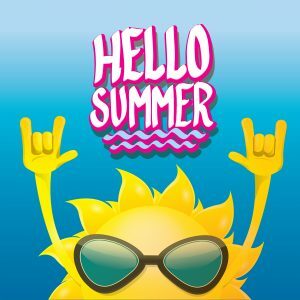 Summer weather peaks in July and August and while this sounds like perfect weather to have a pool day and work on your tan, it takes a toll on your finances. Gasoline prices are higher, utility bills can be higher and longer days lead to more opportunities to spend money. Adjust your thermostat. Do you really need your thermostat set at 72 degrees or will 78 be adequate? Adjusting your thermostat by even 5 degrees can save you roughly 10% off your bill that can be put into savings. Even if you are on a level plan, reduced usage lessens the chance of an increase. Turn off the A/C when not in use. This may seem fairly obvious, but people tend to forget about this. If you are out of the house for several hours each day, turning the air off or down when you leave can save you hundreds of dollars in the long run. If you find yourself forgetting to do this, consider purchasing a programmable thermostat so you can adjust the temperature on the go. Limit oven use. This is often overshadowed. The oven emits a significant amount of heat, raising the temperature in your house, and causing the air conditioner to work harder. Instead, opt for making cooler meals, such as a salads, and using the stove top or microwave more often. Or, consider making your meals outside. This gives you an excuse to grill out! Close the blinds. This is a big one. Just doing this simple step will allow less sunlight to penetrate your house causing your overall temperature to be lower and, therefore, will allow your air conditioner to run less frequently. Unplug devices that are not in use. Everyone knows that devices burn energy when they are turned on, but did you know they also burn energy when they are shut off? That’s right. When it is turned off, it is still using electricity because it is plugged in. Try getting in the habit of unplugging your electronics when you are finished with them or invest in a smart adapter that automatically shuts them off for you. Turn the heat down on your water heater. You don’t really need a hot shower in the summer! Let your dishes and your clothes air dry. Washing machines, dryers and dishwashers heat your home and require a lot of energy. Open your windows. It’s cooler at night and this is a great, inexpensive way to cool your house at night. But make sure to shut them again in the morning.